Today, Americans all over the world give thanks that the English invented them. Bu yong xie, it was our pleasure. 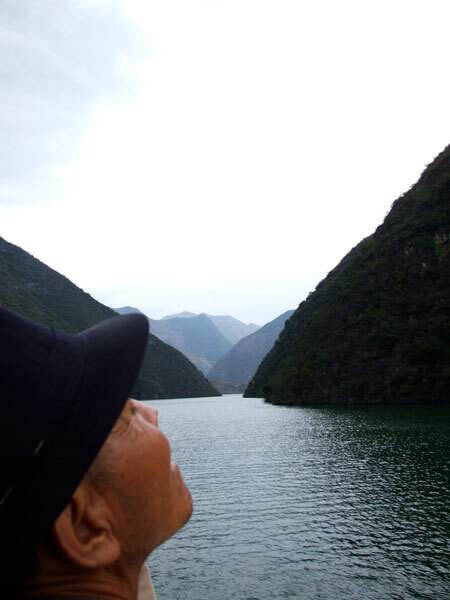 In completely irrelevant celebration, here are six photos from a recent trip from spicy Chongqing down the foggy Yangtze to mind-crunchingly boring Wuhan. 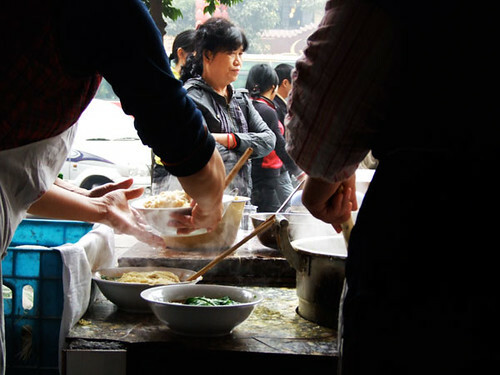 Everyone has time for a noodle pit-stop in Chongqing. Your worth in this city is judged by your tolerance for spice. That night, eating hotpot with friends, I held back tears at the hottest lettuce I have ever tasted. Chongqing’s reputation is of a smog-smothered Gotham. But not far outside the city, the scenery is worthy of a classical painting. 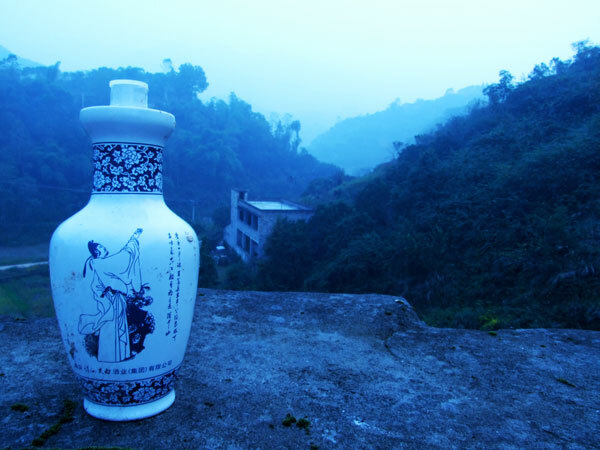 I came across this vase standing on a wall in just such a quiet spot, at dusk. On my boat downstream, I felt like a cow being herded through over-grazed pastures. Here you may take a photo. Here you may pay an extortionate entrance fee to a temple. Here you may chew the cud. 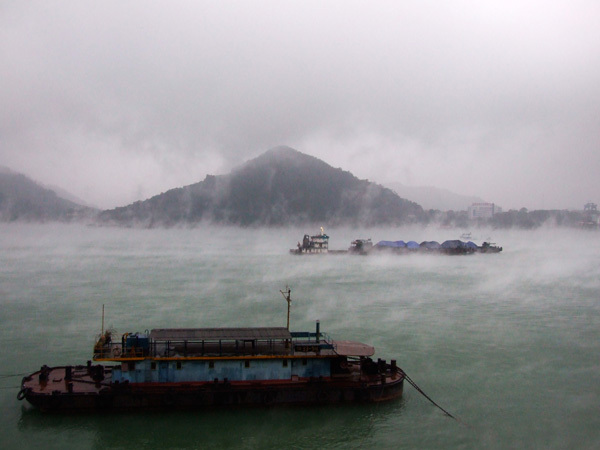 At Yichang, we make port and the Yangtze is shrouded in mist. Behind me, I overhear a Chinese fellow traveller boasting “look, I took 409 photos in three days”. “More than me”, someone replies, enviously. 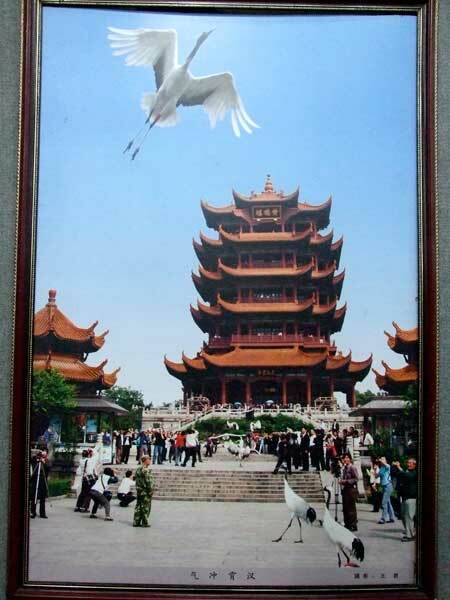 In Wuhan’s Yellow Crane Tower museum, I come across the most obviously photoshopped photograph ever. Brazenly displayed, with others just like it at either side. Seriously, who do they think they’re kidding? 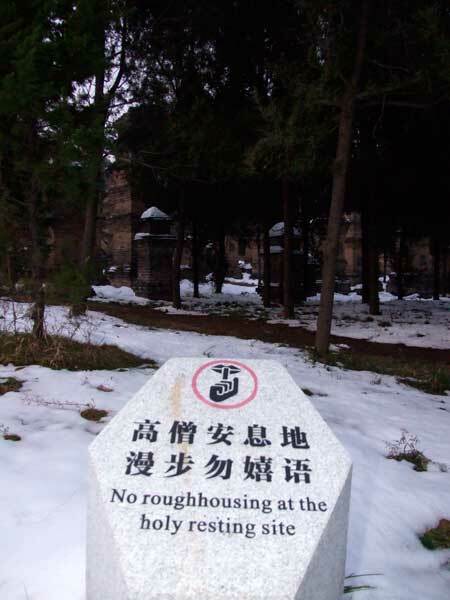 The pagoda forest at Shaolin monastery … the only place on the grounds where fighting is discouraged. The first monk I came across in Shaolin, by the way, asked me how to say ‘shopping’ in English. As a kind of sister post to my last, here areÂ a few photos from aÂ lecture at Peking University (Beida) titled “the Tibet question”. No sensitive topic left behind at Six … next up, FG practitioners commemorating 6.4! As you can see, a packed room (myÂ wide-angle lens would have added another couple of dozen faces). My sweat-glands get uncomfortable at the memory. It was an open event, in the evening, but I gather an unusually big audience even for these popular lectures. It seemsÂ that Tibet attracts the interest of Chinese students, just as with their Western equivalents. This is surely out of the issue’s importance for China’s relations with the world, but also – I’d venture -Â for the same reasonÂ which gets the West shoutingÂ ‘free Tibet’: the romance and mystery of ‘Shangri-la’. ‘Tibet chic’ is a well established phenomenon in big Chinese cities – a well-off family might hang Tibetan scarves or tangka on their wall and enjoy showing jealous friends pictures of their trip to Lhasa (too expensive for most). I’m afraid I had to leave after a half-hour of so of the lecture itself. 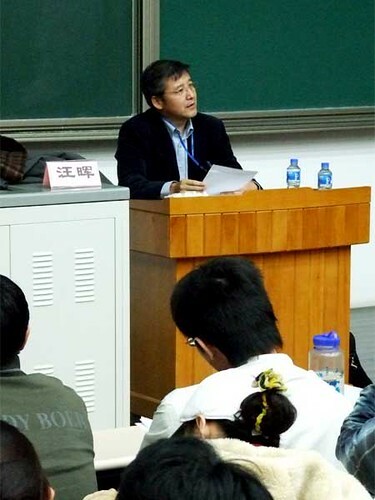 What I heard before I left, though, was the thoughtful Professor Wang saying right off the bat that ‘the Tibet question’ can’t be understood without aÂ solid grasp of the long history behind it – and launching into a potted summary. He did mention the West’s “different perspective” on the issue, which unless I misunderstood his tone was a euphemism for ‘they don’t get it’. Time and again, Beida students strike me not as ‘brainwashed’ onÂ such sensitive issuesÂ (it’s embarrassing to use the term even to refute it), butÂ keen to learn more,Â with a sceptical eye to the information given them to boot. And regardless of the obvious and unforgivable propaganda which still passes forÂ history when it comes to Tibet in the last sixty years, lectures on sensitive issues like Taiwan and Tibet in Tsinghua and Beida are a far cry from poker-faced propaganda, if still hard to swallow at times. I’m back in BeijingÂ afterÂ a spot of travelling, returningÂ to a neglected blogÂ and an overflowing tankard of new Chinese words to cram. 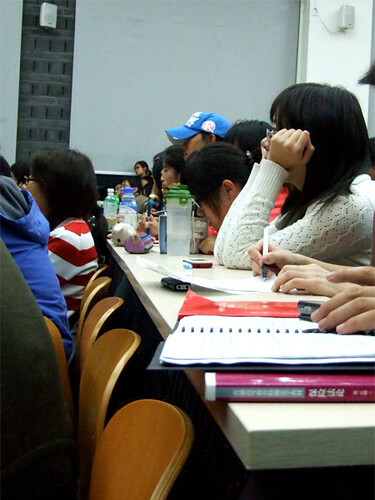 As I begin to sip at the meniscus (oooh, get you with your fancy metaphor), here are two posts from classes I audited in China’s top two universities, where students are glugging diligently at their own studies. On a wednesday afternoon, international relations students at Tsinghua take diplomacy class with teacher He (for it is he). A friend suggested I listen in on one of these, as in the past, teacherÂ He has “shown pictures of him wearing a slightly risque Japanese robe, an animated depiction of China as a rooster eating Japan as a caterpillar, and him standing with a bunch of African girls in their native dress”. He sounds interesting. No ‘slightly risque’ pictures this time, but a lot of holiday snaps. Teacher He clicked through pictures of his various trips to Taiwan, eating local snacks and admiring the view of the sea, while introducing various basic facts. There was evenÂ a picture of him as a kid. And one of the Dalai Lama’s recent trip to TaiwanÂ – the first time I have seen a public image of this personae-non-grata in China outside of ethnically Tibetan areas. 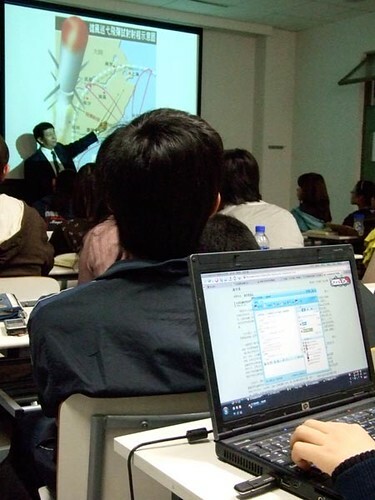 But most of the slides were packed with statistics, andÂ IÂ now get what Chinese friends mean by the ‘powerpoint’ style of teaching in Chinese universities – Tony often complains about this tendency to batter students with slides and facts without going into much detail on any one aspect. After this time spent in just such a class, I don’t doubt it. teacher He tells the class how we must “love and respect” Taiwan for both their ancient culture and achievements, and their modern “economy, democracy, and system of law”. He delivers this as if theÂ norm for his students would be not respecting Taiwan. He relates an anectode when talking with a Taiwan resident, who tells him “I’m Taiwanese, you’re Chinese”. His response: “are we not both Chinese?” The way he says this – asÂ a parent would to a child -Â gets a short laugh from the front of class. Oh, and if you’re wondering what a giant missile is doing on the projection screen, Teacher He is about to explain the military build up of Chinese missiles aimed at Taiwan should a conflict arise. His next slide? Not a blink from any of the Chinese students as this slide pops up, while my US friend and I exchange a raised eyebrow or two. 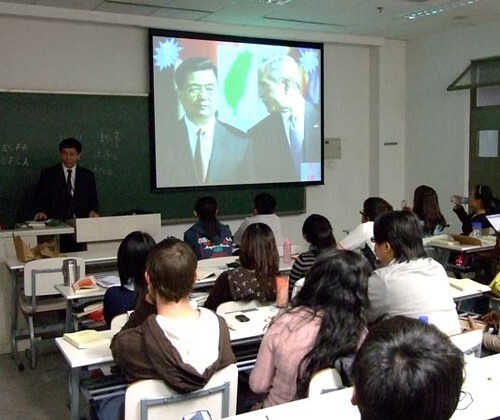 This projection of a Chinese military strike, the class was assured, was made in Taiwan. I’m smelly and unshaven in an internet cafe in Wuhan, and my computer is winking at meÂ to tell meÂ I have five minutes left before my two kuai runs out. Just enough time to point to this post I wrote for enoVate, experts in all things Chinese youth market. The question: do students in Beida, China’s top university, drink coffee or tea? Giving the ‘V for victory’/secretly-dissing-this-person sign (as far as I know, those are the two options for what it means in Britain, not sure elsewhere) is Zhu Hong. 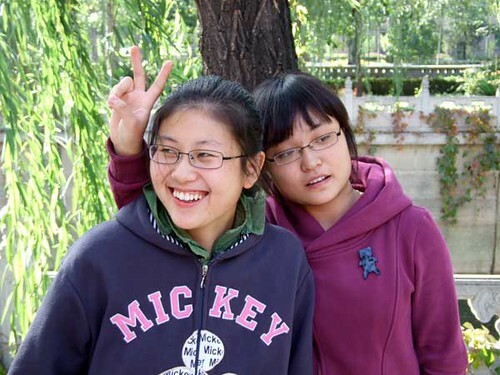 She’s a bubbly personality, majoring in hydraulic engineering at Beijing’s prestigious Tsinghua University. ‘Mickey’/having-the-mickey-taken-out-of-her (oh public school, I miss you so) is the more bashful Shu Longmei, taking civic engineering. 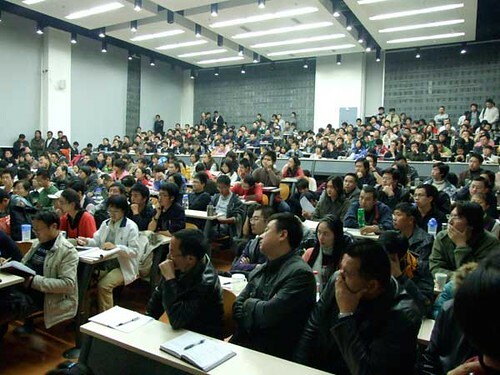 Does every Tsinghua student study engineering, you wonder? Pretty much, it’s China’s equivalent of MIT. And how many of them are girls? Not too many. It seems that the campus buzz-cuts are scared off by long-locked classmates who know more about suspension bridges and treble-pulleyed-pressure-gears (if such a thing exists) than Tang dynasty poetry like the pretty girls at neighbouring Beida study. In other words, the image is that Tsinghua’s girls aren’t exactly Zhang Ziyis. Another ‘engineering girl’ I chatted with tells me a long-standing student inside-joke: “There are three types of people: guys, girls and Tsinghua girls.” Sometimes, they add a fourth: “guys who are the boyfriends of Tsinghua girls”.